For as long as I have been at our nursery school, our Pre-K class has always put on a Thanksgiving celebration. 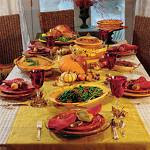 This celebration includes a presentation by the classes and a big "feast." The childr en begin at the first class of November preparing for the big day. They usually have about 3 weeks or 9 classes to get ready. During this time they are learning lots of songs, poems, and fingerplays. They are making Native American crafts, and pilgrim crafts. (One of our classes is Native Americans, and the other class is pilgrims.) They are also making centerpieces for the tables and decorations for the walls. (Not a lot of breathing time for our Pre-K teachers this month). Many years ago when I started our "feast," was a real feast. We used to have turkey, mashed potatoes, corn, muffins, sweet potatoes, rolls, pumpkin pie, whipped cream, brownies, cookies, etc.--the whole nine yards. Then the church got renovated and we had nowhere to keep food warm, plus we had so many left overs. Our "feast" now consists of a much simpler menu. We have sliced deli ham and turkey, cheese, rolls for sandwiches or just to eat, fruit and vegetable trays, potato chips and pretzels. We still have a great dessert table with the pumpkin pies, cookies, cakes, brownies, etc. It is a sight to behold. For our "feast" the food is provided by the parents. I post a list two weeks prior to the event asking each parent to donate one item on the list. Then on the day of the celebration, they bring their item with them to school and we set it out on the tables. The school always provides the plates, napkins, utensils, condiments, coffee, and tea. On the big day the children come to school a little later so they are there over lu nch. For the first half hour everyone is getting dressed for the occasion. We were lucky enough to have a parent make us some cute aprons for our pilgrim girls. We do ask them all to bring in a little basket to carry. The boys all have a hat and the girls have a bonnet, apron, and carry a basket. Our Native Americans have a headband, tom tom, necklace, and sometimes a vest. After everyone is dressed, we line up and head down to the church. All the parents are waiting in the church area. Some have helped me set-up while the children were getting dressed. The children enter the church--each class comes in accompanied by appropriate music playing on the CD player. They put on their performance, we say our prayer, and everyone files over to the Family Life Center to fill our bellies with all the wonderful food provided. It is an event that takes a lot of work, but I know how much the parents have appreciated it throughout the years. Have a nice thanksgiving ..